Thomas Dinardi was making frequent visits to a nearby Emergency Room due to worsening congestive heart failure and shortness of breath. After an ER visit in March 2017 to Columbia Memorial Hospital in Hudson, N.Y., CMH Cardiologist Barton Schoenfeld, M.D. enrolled Dinardi in a new Remote Patient Monitoring kit that includes an iPhone, bluetooth-based biometric devices, and a clinical case manager. The goal is to use the monitoring system to improve the health of patients like Dinardi and avoid costly and time-consuming ER visits. 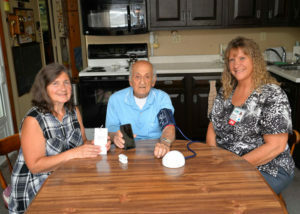 Thomas Dinardi works with the Remote Patient Monitoring system at his home in Hudson with case manager Kelly Meus, RN, at right, and his daughter, Sandra Merritt. So far, it’s working for Dinardi, who is a 93-year-old Hudson resident and U.S. Army veteran who served in World War II. And, CMH is planning to roll out even more kits in the next few weeks. “When I started the program, I couldn’t walk to the mailbox and back. Now, I can,” said Dinardi, who has achieved consistent weight loss and improved mobility since starting the program. Remote Patient Monitoring, or RPM, was created in a partnership between CMH and YouThisMe, abbreviated UTM. It was designed for patients with common chronic conditions such as congestive heart failure, myocardial infarction (heart attack), COPD (chronic obstructive pulmonary disease), diabetes and pneumonia. Upon discharge from the ER or hospital, a patient is given an iPhone pre-loaded with the RPM app and several wireless biometric devices. The devices include a Bluetooth-based scale, blood pressure cuff, and pulse oximeter. A provider enters acceptable data ranges into a patient monitoring dashboard before issuing the kit. From home, the patient electronically sends vital information each day including pulse/pulse oximetry, blood pressure, and weight. They also answer three simple health-related questions. The questions are: Do you feel better?, How is your breathing? and Do you want a call? A case manager reviews the patient data on a smartphone or desktop computer and intervenes if an automated alert shows data outside the preset vitals range or if the patient requests a call. Case managers like Kelly Meus, RN use the patient data dashboard to monitor patients. It’s like a high-tech version of house call visits doctors once made, she said. “Patients like Mr. Dinardi often go home feeling overwhelmed. But, the Remote Patient Monitoring System gives them a sense of empowerment and makes them feel like they have a blueprint to follow to better health,” Meus said. When Dinardi got started, his daughter Sandra Merritt created a set of flash cards to help use the iPhone and medical equipment. The cards helped and Dinardi become more consistent with daily reporting. 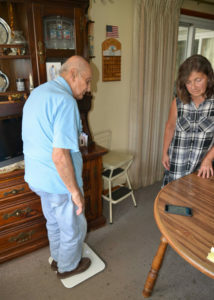 Thomas Dinardi works with a Bluetooth scale, part of the Remote Patient Monitoring system, at his home in Hudson. His daughter, Sandra Merritt, checks that the scale is working. With a good sense of humor, Dinardi acknowledged that he has witnessed huge changes in medical care since his days as a U.S. Army medical tech aboard Merchant Marine hospital ships in the Mediterranean during the 1940s. The ships treated wounded soldiers from the battlefield and ferried them back to the United States. “So with this new system, if nobody calls me at home, that means I’m doing something right,” Dinardi joked. Dr. Ronald J. Pope is the Medical Director of CMH Care Centers and a board-certified family physician who helped create the RPM system. He believes hospitals across the nation may end up using similar systems in order to reduce readmission costs and meet federal government directives. “About 20 percent of all hospital or ER patients are readmitted within 30 days on a national scale. Many patients don’t recognize deterioration in their symptoms and don’t ask for help until they are back in the hospital. With the RPM system, we can identify symptoms much earlier and intervene to help patients,” Pope said. Pope and his team of support staff and case managers plan to begin offering the kits in the next few weeks and hope to have 50 or more in action by the end of 2017.